As The National Archives notes, there are many rewards to be reaped from brands digitising their heritage collections. Opening up access for employees to rediscover the brand’s heritage and unlock the value held there, reducing travel costs, and generating revenue from the digitised collections are just a few of these. One high profile example of a brand utilising its digitised archives is the recent collaboration between celebrity Alexa Chung and Marks & Spencer to produce the aptly named “Archive” clothing collection. Chung scoured the M&S fashion archives to identify classic designs, which have been reproduced for contemporary consumers. And this is far from an isolated example. So to highlight some of the brilliant corporate archives being digitised out there and the inspiring ways that these resources are being used; we asked archivists working with John Lewis, Diageo, British Pathé, and fashion designer Zandra Rhodes to share their stories. “We hold a wide variety of heritage material – from photographs and advertising, to company magazines – at our heritage centre in Berkshire. This includes 25,000 paper designs and fragile textile samples; dating back to 1795 and featuring patterns by well-known designers like Pugin, Voysey and Dresser. The fabric designs from this collection were frequently referenced and handled by other internal partners, particularly our Design departments – but they had to travel to view the archive. 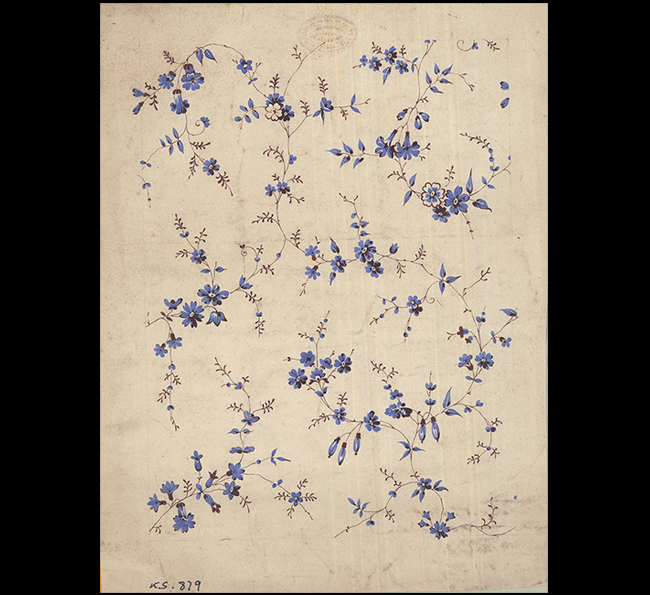 To us, digitising the original designs meant that they could be conserved, and we also liked the idea of opening up and improving internal access to the collection for partners – beyond Heritage Services staff. 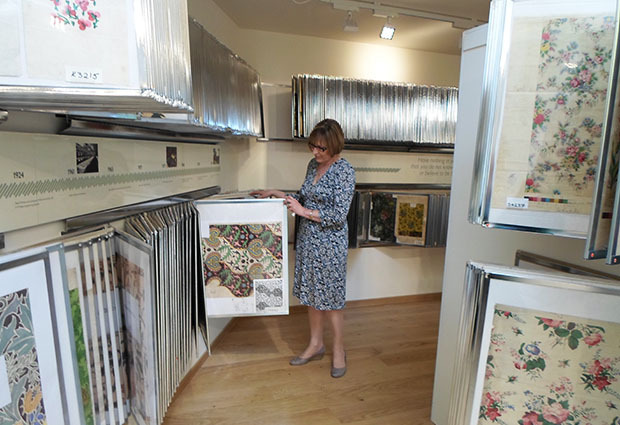 We outsourced the slightly tricky task of digitising the larger designs and so far around 2000 textile designs have been scanned, with the digitised collection now accessible to relevant departments across John Lewis. Our Press and PR teams frequently use the digitised content, in addition to the Design teams who use the images to inspire new products and designs. One example in fact… one of the digitised textile patterns (pictured above) was recently used by the Design team and repurposed as part of a new range of mugs, which were sold through our Waitrose stores. 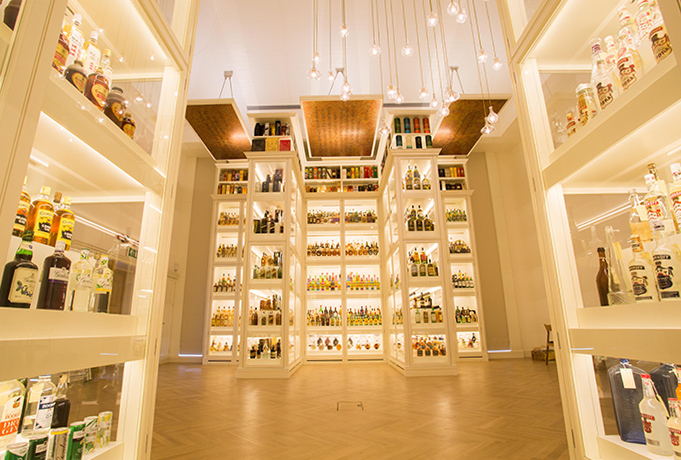 “As we are such a global company, the Diageo Archives hold a vast amount of material, including advertisements and promotional items, minute books, recipes and 3D artefacts – like bottles. These are frequently used by other departments. However whilst it’s excellent to have all this brand history in one place, it meant that anyone wanting to view material had to physically come to the archive – not ideal. And of course there is the growing expectation for everything to be available digitally. So we made the decision to digitise. We adopted a demand-led approach and prioritised which materials were digitised based on popularity. So far we have scanned our company magazines, annual reports, minute books, and a variety of advertising material; including photographs and print adverts for the UK and Global market. Having these materials digitised has definitely allowed us to respond to requests from M&I more effectively. We are more aware of the rich content that we have to support brand projects and we can supply the materials easily, now they have been digitised. For example in 2011, the Archive team were engaged in a new brand project to create whisky embassies across the globe. Not only were the Archive team able to provide brand information and stories for these new spaces but could access the digitised archive to find and share vintage advertising designs relating to the specific country or region that could be used to create wallpaper and decorate other furnishings. 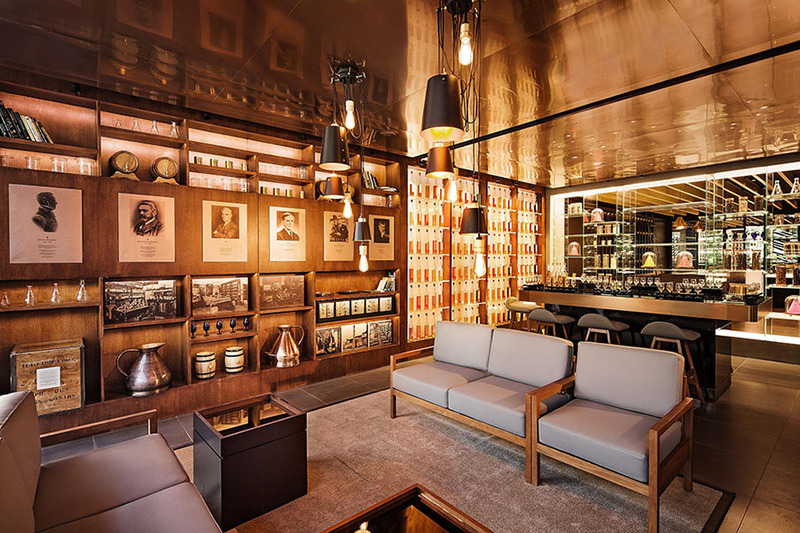 These archive inspired furnishings were then used in the first Johnnie Walker House installation in Shanghai – a consumer engagement space (pictured above). Because we had our advertisement guard books digitally available and searchable – this was an easy task. It’s great to see our heritage material being used in this way. “UCA’s Chancellor, Zandra Rhodes is one of the most famous names in British fashion from the last 50 years. 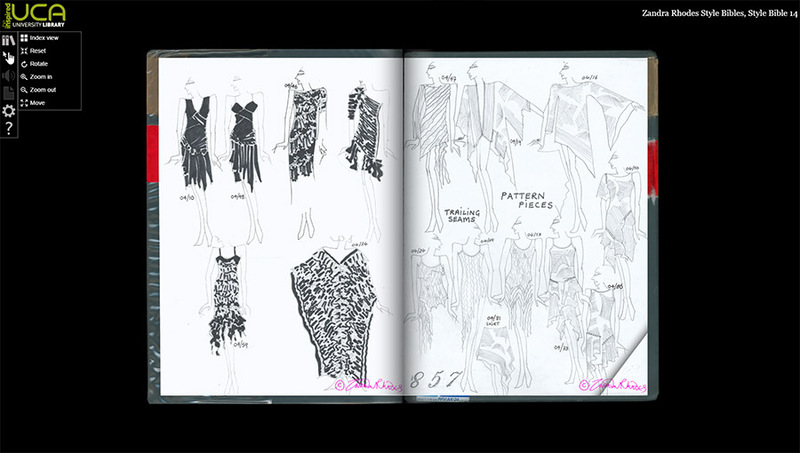 Her works include haute couture dresses worn by icons like Diana, Princess of Wales; Elizabeth Taylor and Diana Ross. As such her brand’s archives contain circa 6000 garments and a series of design drawings – the “Zandra Rhodes Style Bibles” – recording all of Zandra’s designs from 1960 to present. Zandra wanted her archive to inspire and educate future generations, so we decided on a project aimed at digitising part of the collection and creating a worldwide fashion resource. Funded by JISC, we ran the project in collaboration with Zandra’s studio team, photographers and student interns from our Fashion and Textile courses – who assisted us throughout. Over two years, we digitised 500 garments and all of Zandra’s style bibles. Now published online, the collection provides free global access to this invaluable cultural and fashion heritage. Alongside the digitised archive, we also filmed a series of tutorials with Zandra and her team demonstrating techniques plus interviews talking about her inspirations. This complete collection of digitised designs, garments and interview footage offers educational and research opportunities for the current and future generations of designers. At UCA, we also use the collection in our training on research data management for artists and designers, when discussing how they should catalogue their work and maintain records. Although I can’t speak on behalf of Zandra, UCA’s students have benefitted from the digitisation project and we hope it will continue to inspire future designers. 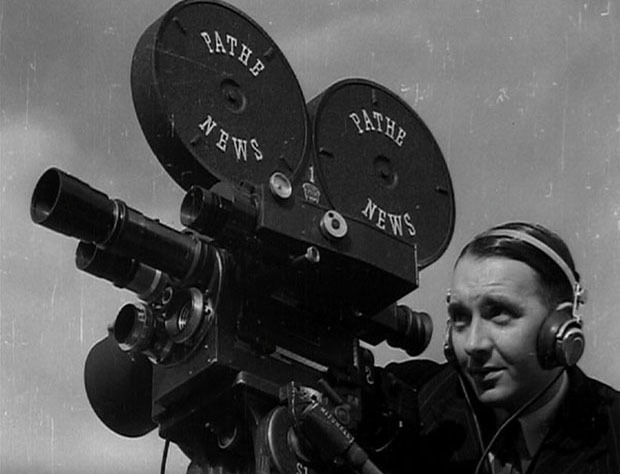 “British Pathé was a pioneer of filmed news and in the course of its history amassed a treasure trove of 85,000 films. We digitised the entire collection back in 2002, which gave us a head start on other archives. We now don’t have to dig a dusty old film can out of the depths of a vault every time we need some footage. It’s all just a few clicks away. One of the best decisions made was to create a digital stills collection as well. By capturing one frame every second of film as a JPEG image, we developed a vast image archive of 12 million stills covering everything from war to people’s eccentric hobbies. This enabled us to provide images for publication in print, produce online galleries, and even sell framed pictures for people’s walls. Plus research was made so much easier, because rather than watching a film in full to find that one second of footage, we can quickly scan down a page of stills to find the piece we need. Because the collection is online on britishpathe.com and YouTube, our customers (including broadcasters, producers, museums and schools) can explore the archive around the clock. This ease of access has been brilliant for our visibility – especially with younger people who weren’t even alive when Pathé News was being shown in cinemas. Is there another fantastic online brand archive we missed? Or a brand doing amazing things with its digitised heritage content that deserves a mention? Let us know in the comments below, tweet us, or get in touch via email.